The Curiosity rover, with RAD mounted to its top deck, was folded inside the MSL spacecraft on its trip to Mars, sitting immediately beneath the descent module and above the heat shield. The spacecraft and various internal structures provided complicated levels of shielding against the deep space radiation environment. A spacecraft carrying humans would likely be designed to have a more homogeneous mass distribution with few if any lightly shielded paths into inhabited areas. To keep astronauts safe and healthy during future missions to Mars, superfast new propulsion technologies will likely be necessary, experts say. Crewmembers flying to Mars and back using traditional chemical thrusters would be exposed to the high radiation levels of deep space for 12 to 17 months. That's simply too long to keep astronauts' radiation doses from fast-moving particles known as galactic cosmic rays within currently acceptable limits, researchers said. "We need to get there faster to reduce the impact of the galactic cosmic rays, but we need to have shielding, local shielding, on board to eliminate the effects of solar particle events," Eddie Semones, spaceflight radiation health officer at NASA's Johnson Space Center in Houston, told reporters Thursday (May 30). "So it's hand in hand." NASA astronauts are not allowed to accumulate a career radiation dose that would increase their lifetime risk of developing fatal cancer by more than 3 percent. For perspective, a career dose of 1 Sievert (or 1,000 millisieverts) is associated with a 5 percent increased risk. While scientists have long suspected that a manned Mars mission would brush dangerously close to upper dose limits, data gathered by NASA's Mars rover Curiosity rover during its eight-month cruise to the Red Planet last year have enabled them to put some hard numbers on the problem. That's bad news for a traditionally powered manned Mars mission. "Given this data, and our models that confirm it, we currently would exceed our acceptable limits of 3 percent excess fatal cancer," Semones said. Radiation levels on the Martian surface are expected to be considerably lower than those in deep space. Preliminary results from Curiosity announced late last year suggest that astronauts walking around on the Red Planet would receive about 0.7 millisieverts per day — roughly the same dose experienced by crewmembers of the International Space Station. Surrounding crewmembers with water would help lower their radiation dose during the trek to Mars, because hydrogen is the best known shield against cosmic rays, said Chris Moore, deputy director of advanced exploration systems at NASA Headquarters in Washington, D.C. But Moore agreed with Semones that advanced propulsion systems are also needed. He specifically mentioned nuclear thermal rockets as a promising option, saying they could potentially cut the total travel time to 180 days. Such a system is far from ready for action, however. "It's a long-range technology-development activity, and it will probably be many years before that is ready," Moore said. "But it is part of our mission architecture for sending humans to Mars, is to use nuclear rockets." NASA is currently working toward getting astronauts to the vicinity of Mars by the mid-2030s, as directed by President Barack Obama. The space agency may still launch a manned mission around that time, even if superfast new propulsion systems aren't yet ready to go, officials said. 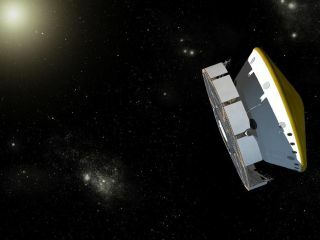 "We're looking at that standard, that 3 percent standard, and its applicability for exploration-type missions," Semones said. "Those discussions are going forward now on how to handle that, and what steps we can take to protect the crew."